The authors conclude that this specific blue light receptors and light processing is an evolutionary adaptation to the ecological environment of the fish. The study is an interdisciplinary biological approach combining the expertise of geneticist Dr. Minou Nowrousian and Prof Dr. Ulrich Kück, molecular biologist Dr. Melanie Mark, zoologists Dr. Jens Hellinger and Dr. Marcel Donner as well as physiologist and optogeneticist Prof Dr. Stefan Herlitze. Next, the research team analysed if Anomalops katoptron uses blue light for behavioural responses. They performed a Pavlovian conditioning task with eight fish, where the fish had to associate feeding with a specific light pulse. "The fish were fed in darkness, but we used a strong red flashlight to illuminate the feeding area. We thought originally that the fish cannot see the red light," says Jens Hellinger, "but found that they can associate the red light with food. Thus, once we switched on the red light at the corner of the aquarium, the fish swam into the light beam." 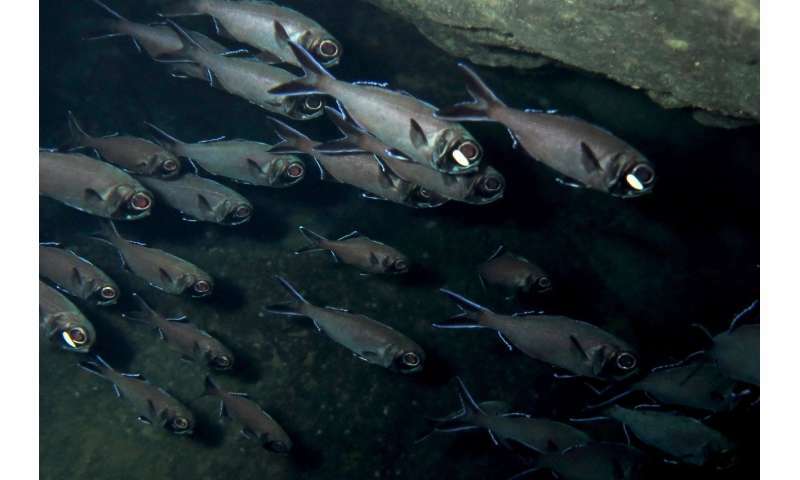 "The visual system of flashlight fish seems to be adapted to detect low intensity light, such as star light or bioluminescent light to adjust their own behaviour," concluded Stefan Herlitze. The low light detection reveals a new behavioural function of bioluminescence in fish.